Ford has had problems transporting the Fiesta after railroads in northern Mexico were damaged by Hurricane Alex in late June, and later by Tropical Storm Bonnie. DETROIT -- Ford Motor Co. expects sales of new light vehicles in July to trump results in the year-ago period, largely due to increased sales of the F-series pickup. In July 2009, Ford sold 158,838 vehicles. Those sales are expected to be “slightly” higher this July, George Pipas, Ford's chief sales analyst, said today. Pipas said the federal government's cash-for-clunkers incentive program -- launched in late July 2009 -- created a “sales tsunami” for small cars with four-cylinder engines. Therefore, demand for smaller Ford vehicles, such as the Focus sedan and Escape crossover, probably will be down in July vs. last year. But the F series was not a big seller during cash for clunkers. It's selling well now with the introduction this spring of a restyled 2011 Super Duty version. “Don't be surprised to see stronger sales gains on the larger vehicles vs. last year,” Pipas told reporters today. Sales of the F-series pickup for the first six months are up 34 percent to 240,345 units compared with the year-ago period. Pipas predicted that gain would rise to 40 percent this month. July “will be the largest F-series month in terms of absolute volume since March 2008,” Pipas said. In March 2008, Ford sold 54,465 F-series pickups. Ford will increase its retail market share in July vs. a year earlier, Pipas said. In July 2009 Ford had a 13.5percent retail market share. Edmunds.com predicts new-vehicle sales -- including fleet sales -- in July will total 1.06 million units, an 8.4 percent increase from July 2009 and an 8.9 percent increase from June 2010. Edmunds.com analysts estimate the annual sales rate will be 11.8 million, up from 11.1 million in June 2010 and that same rate in July 2009. Ford is not so optimistic. Pipas predicts the industry sales rate for new light vehicles through July will be 11.2 million to 11.4 million units. Ford expects sales to be about 1.05 million units compared with 1.01 million in July 2009. “We see it as better, but not as good as some are reporting,” Pipas said. Industry fleet sales for July will be at the lowest point of the year, he said. For the first half of the year, fleet sales comprised 23 percent of industry sales, Pipas said. In July, fleet sales will be 15 percent to 17 percent of industry sales. Ford will not make any production changes in the third quarter, Pipas said, but it will give guidance on fourth-quarter production schedules during its sales call Tuesday, Aug. 3. Ford incentive spending in July will come in at about $150 more per vehicle compared with the year-ago period, Pipas said. He expects that to match industry incentive spending gains. 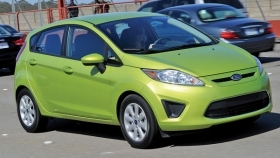 As of today, Ford has about 2,500 of the 2011 Fiesta subcompact cars in dealer stock, Pipas said. Ford started building the car at its plant in Cuautitlan, Mexico, in early May. But Ford has had problems with transporting the car after railroads in northern Mexico were damaged by Hurricane Alex on June 30, and later by Tropical Storm Bonnie. In response, Ford has redirected shipments. Pipas said the weather damage no longer is an issue, but the average transport time from the plant to U.S. dealerships is about 23 days. That compares with an average of 12 days to get a vehicle from a U.S. plant to dealerships. There are 6,000 Fiestas in transit now to U.S. dealerships, Pipas said.